Last weekend, Penn's Landing in Philadelphia had a new structure, a 12-foot-tall PNC Bank branch made out of 5,000 pounds of gingerbread. Why? The bank's agency, Deutsch, wanted to get consumers excited about PNC's annual Christmas Price Index, which prices out each gift from "The Twelve Days of Christmas." "The Christmas Price Index was created to make learning about the economy a bit more fun," said Jeremy Bernstein, evp and group creative director at Deutsch. "For this to happen, though, we needed to grab people's attention. We are so inundated with holiday messages this time of year, we knew we needed to do something attention-getting and hard to ignore." A functioning bank branch made out of inedible gingerbread (it had to be treated for durability and weatherproofing) that provided actual banking services—customers could use the ATM (17 percent of the 5,465 visitors did) or open a new account (visitors did)—certainly fit the bill. 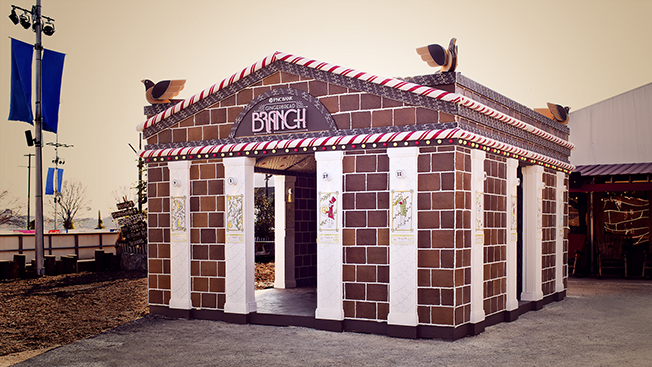 Deutsch partnered with Design Compendium and Bredenbeck's Bakery in Philadelphia to create the gingerbread bank, which was in development for six months and took four days to build. The walls, ceiling and floor, as well as many of the interior and exterior components of the structure, were preassembled in Brooklyn. "We felt strongly that the branch read as bank, not a gingerbread house," said Bernstein. "Our design team geeked out on a ton of architectural and design references and honed in on an Art Deco style. Today's banks are mostly boring boxes, so they looked at great banks from earlier eras like the Williamsburgh Savings Bank in Brooklyn. They also drew inspiration from other great Art Deco buildings like the MetLife Building, Rockefeller Center and the Chrysler Building." Deutsch also created custom illustrations of each of the 12 gifts from the Christmas carol for the gingerbread branch's 12 columns. Design Development, Fabrication: Design Compendium, Brooklyn, N.Y.